2) Heat pan over medium heat. When pan is hot, melt a little butter in the pan. 3) Dip slice of bread in egg/milk mixture. Make sure both sides are covered. 4) Fry bread until brown on each side. About 2-3 minutes per side. 5) Add sweets on top: syrup, honey, powdered sugar, jam. –We like to remove the milk and add applejuice instead. Then fry a couple thin slices of apple on the pan with some butter after you’ve finished cooking the bread. 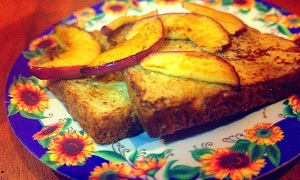 The fried apples make a delicious topping for the french toast. –Jam works well on top of the french toast as well.